REACT’s second Training of Trainers module took place in Kampong Cham, Cambodia, from March 6th to 8th, 2018. 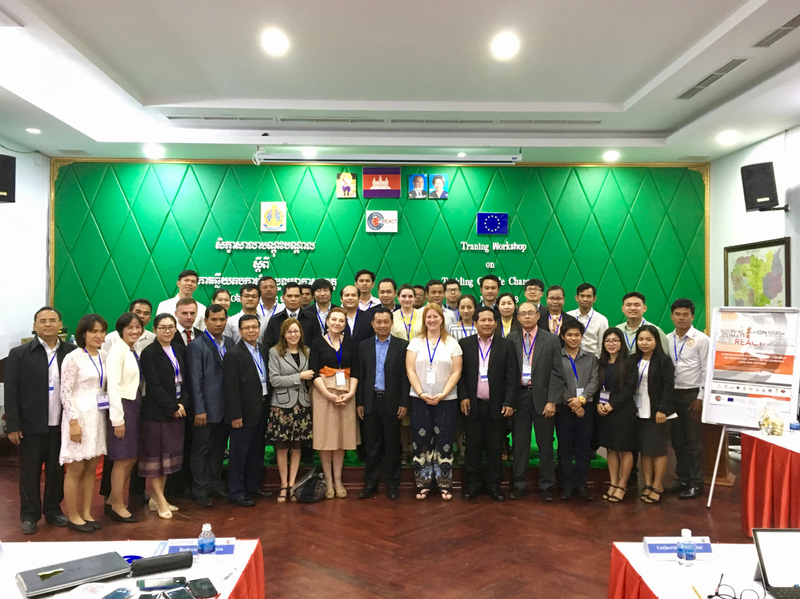 The event was hosted by University Heng Samrin Thbongkhmon (UHST) and took place at the LBN Asia Hotel in Kampong Cham. The Rector of UHST, H.E. Vannaro PIN, and the Director General of the Directorate General of Higher Education (MoEYS), H.E. Ngoy MAK, inaugurated the training and welcomed the participants to Cambodia. In his speech, His Excellengy Ngoy MAK made a particular note of the challenges Cambodia is already facing due to Climate Change, with an increasing frequency and intensity of natural hazards such as floods and droughts, and how the Royal Government of Cambodia is taking actions to increase the country’s resilience in the face of these challenges. Over 40 people participated in the training delivered by experts from REACT partner Institut Euro-Méditerranéen en Science du Risque (IEMSR). They were from partner institutions in Cambodia, Laos and Vietnam, as well as another seven Cambodian Higher Education Institutions. Increase their knowledge and understanding on Climate Change and the international framework concerning Climate Change actions. Learn how to analyse/prevent/manage risks related to climate variability and develop solutions for risk management, adaptation & mitigation through local case studies. The training was structured along a series of plenary presentations, interspersed with practical exercises done in small groups. Specific topics included an Introduction to Climate Change. Notions, terminology, local examples and interactive exercises; International Institutional Framework on Climate Change; Human Rights, tool in the fight against Climate Change; Adaptation, Risk Management Strategy and Methodological tools for managing Climate Change. In their feedback after the event, participants expressed great interest in the notions learned, and said that the practical exercises and discussions held were very useful. Following the training, REACT partners held a 1-day coordination meeting on the campus of UHST, with working sessions centred on the launching of the REACT Research & Academic Units in Climate Change and on adapting the trainings received in Laos (Nov.2017) and now in Cambodia to their local context so the partners could replicate them both on an internal and national level this coming Spring.